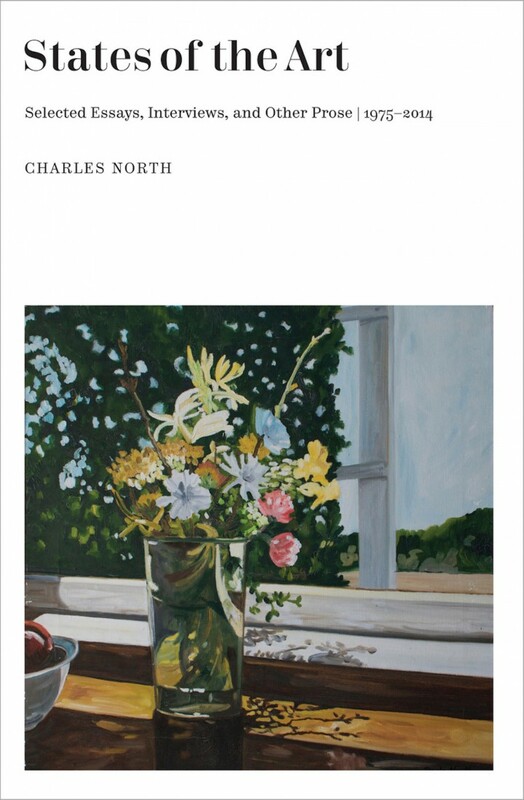 Charles North’s book, States of the Art: Selected Essays, Interviews, and Other Prose 1975–2014, was recently published by the late Bill Corbett’s Pressed Wafer. 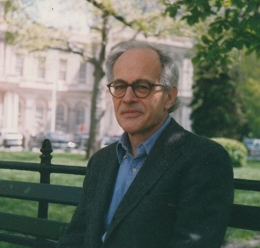 The book is made up of his reviews, occasional pieces, lectures, statements, interviews, and a prose poem or two — written mostly in his home city of New York. One remarkable thing about States is its combination of clarity, philosophical rigor, and imagination. The fact that North also has a flare for the impressionistic makes his book hard to put down. Like Edwin Denby, a poet who wrote about dance, North finds analogies between art forms, life and work, and his writing benefits from new understanding found by way of creative explorations of various states and affinities. Here, States of the Art change and are constantly examined, subject to inquiry, and North goes into the implications and particularities of each of these states. In his prose, North writes to reinspire a sense for where one’s tastes and attentions might lie and what they lead to, or else how they might get in the way of an otherwise enriching experience. Anyone considering the state of the arts in contemporary society can find it rather bleak, at least as far as financial support might go, which isn’t far. In March of 2017, the President proposed to cut funding for the National Endowment for the Arts, to give an example. Yet the demand for higher caliber art in any medium remains in order; reading the essays in States, it’s apparent that this isn’t a new state of affairs. As critical as North tends to be of much contemporary poetry, he’s also generous, unpredictable — with a sense of humor and a flare for provisionality, the arbitrary and the quotidian. As he aptly puts it, “a writing life that proceeds with no advance assurances” (150). The vitality of his own poems is also present in North’s prose. Like his poems, the writing in States of the Art bears the marks of supreme attention, consideration, nimble reply, and his deeper criticism evokes the gentle cacophony that occurs when one thinks hard about things that, in the end, have no right or wrong way about them. This way of engaging is an indulgence that gives way to amusement, stupefaction. Reading North’s close-reading of certain poems makes it seem necessary, maybe even urgent, to pay attention. In doing so, the poetry, the art and entertainment of it (the mystery too), return. More than this, though, is the joy of thought, and language as its vehicle, on display. The book weighs in at 300 pages, but it’s only a selection of work by a poet who — occasionally, mostly by invitation — writes prose. (The picture of the “occasional critic” is a charming one, eschewing careerism for the satisfaction of the act.) The takes here are refreshing, invariably a kind of “practical criticism” (149) that focuses on enterprises that somehow fail to take into account “what you want, what we want, from art” (115). North has an exquisite critical sensibility; his points of focus change, open up, throughout the decades covered, as his utter defiance of what gets in the way of creative impetus (and good writing) stays a consistent point of admonishment. Those barriers to quality are, for North, careerism; academicism; theoretical impracticalities; jargon and grandiose concepts; superficial trends and conventions. In short, he looks askance at unhelpful habits of mind, “ways of thinking that work splendidly in a great many areas but fall down on the job when it comes to poetry” (239). The book is full of accessible reminders of what poetry and art can be, and anyone looking to read, write, or create something artistic will find this book to be insightful in ways that have practical value. For nearly a half-century, North has been steeped in writing poetry and prose. In late 1966, the year that Frank O’Hara died, he studied with the poet Kenneth Koch at the New School, and in 1970 joined the poet Tony Towle’s workshop at the St. Mark’s Poetry Project. Both Koch and O’Hara had mentored Towle, who became a friend and constant source of encouragement and feedback for North as a poet. It’s worth mentioning O’Hara because it’s within that lineage that we find North’s work, both in poetry and in art (and literature) criticism. The poetry/art connection — taken up by Bill Berkson, John Ashbery, Kenneth Koch, and many others alongside North — is, in addition to a passion for looking at and writing about art, typified by a requirement for delight, surprise and a consideration for the everyday, the conversational. In keeping with the above lineage, North’s connection to the visual artists remains constant. He’s married to the painter Paula North, with whom he collaborates; he’s also collaborated with the painters Trevor Winkfield and Jane Freilicher. Surprise — as vital to both the creation of art and responses to it — is readily discernible in North’s prose. But North’s prose also evidences a depth of thinking and feeling that are emblematic of a philosophical mind — rarely self-expressive but also never detached. He’s nimble and contemplative. It’s no surprise that North studied philosophy, or that his passion for music began at an early age. Being a talented clarinetist, he considered a career in music. His interest clearly shows up in his writing. North’s poems and prose show genuine curiosity, and in many cases excited (occasionally, vehemently irked — which is also enjoyable) by the subjects about which he writes. He’s never writing just to impress. In “Leaping & Creeping: Several Lectures,” he poses some difficult, important questions: “Do we really want to elevate our analytical and intellectual selves to such an extent over our emotional or aesthetic selves? Is poetics conceivably more exciting than poetry?” (120), believing also in art’s “capacity for magic” (116), i.e. surprise. These issues ought to be brought up, especially when thinking about the state of the world can threaten to get in the way of creating anything at all (353). With North, it’s always a matter of thinking and/or talking through something, in a language he knows well. His critical position is still one of inquisitiveness, in that he isn’t there just to persuade, is never merely dutiful — even when he’s trying to do justice to some under-appreciated writer or artist whom he admires. One particular selection in the book, “Ode to Asparagus, Peonies and Manet,” is a personal favorite, and admittedly a reason that I decided to try to write about art having first encountered it in chapbook form. The essay is a bit like a notebook entry in its digression and format; it’s peripatetic, exploratory, investigative, scholarly, funny. “I can’t get over the bunch of asparagus,” he confesses “(the expensive white kind, but looking rather dumpy here) bound by twine, tilted slightly up on their disorderly bed of bright greens)” (210). The whole thing apparently occasioned by a love of some of Manet’s paintings and the desire to go back and see why, and it reminds me now of the fact that North’s own art writing resembles that of Fairfield Porter, a painter that wrote about art who is also covered in North’s book. The art writings by both Porter and North are conducted in a spirit of absorption, consideration and creative expression, and the way that North describes Porter’s writing is funnily in keeping with my perception of the former. For example, North seems to value the same kind of rogue M.O. that Porter adopted, the latter having replied to Clement Greenberg’s charge to curtail figuration by telling Willem de Kooning, “if that’s what he [Greenberg] says, I think I will do just exactly what he says I can’t do!” (129). North is similarly not at all intoxicated by the canon, particularly fashionable attitudes or styles. The book features other novel things, including one of North’s wonderful baseball lineup poems, here composed of prose snippets, “A Midwinter Lineup.” In this poem (which is unlike any poem I’ve encountered, catalogue or otherwise) from his ongoing serial Lineups, quotations form a baseball batting order and also occupy positions on the field: Gertrude Stein’s “I like a view but I like to sit with my back turned to it” plays catcher! (Some of his other lineups comprise parts of the body, vegetables, diseases, rooms, famous couples, tall people (142), i.e., things, places, and people nowhere to be found on a baseball diamond.) The lineup poems are further indication of affinities with Porter, in that their aphoristic quality resembles Porter’s Short Reviews. Both are examples of how to say a lot in very few words, and how words can mean a lot, or likewise very little. “Go back to ya prayin’ tomato,” stated by Big Jule (from the musical Guys and Dolls), is on North’s roster — playing right field. Wallace Stevens said — something like — the best poems are the ones you meant to write. That has a nice sound to it, but it’s hard to see how he or anyone would know that. It would be hard, for example, to accept the notion that there are ideas one meant to have. Poems underneath every peeling sycamore and inside every filing cabinet, along with ideas about poetry and unaccountable other ideas. This highlights the indeterminacy that seems to excite North’s imagination, along with the certainty that such a mind can’t help but entertain. If one tried to categorize North as a poet, beyond the so-called second generation New York School, it might be L=A=N=G=U=A=G=E, but that’s not quite right. North’s wide-ranging frame of reference, his internalized knowledge and affinities give his writing a deeper purpose, connecting his contemporary world to the past, much more than ordinary wordplay might. North seems always to be asking where have we been, and where the hell is it that we’re going? He’s not satisfied to merely become acquainted with and then revel in past masters, and his interest in and dedication to contemporary poetry necessitates and inspires his impassioned, sharp-eyed critique.